What Can You Clean With Sun Joe SPX? Sun Joe is a leading manufacturer of residential pressure washers with dozens of models that will satisfy all your cleaning needs. We will provide an unbiased Sun Joe SPX3000 review since this is one of their best-selling units. We will test it and share our point of view that will include pros, cons, and the rest of the important information about the product. The SunJoe SPX300 Pressure Joe is a cleaning unit that provides 2030 PSI at 1.76 GPM, which means that the total cleaning power is 3573. We have taken this pressure washer and tested it on various surfaces, and we were pleasantly surprised by its versatility. The unit has a beautiful and modern design. It almost belongs to compact units due to its weigh – just 31 pounds in total. When it comes to equipment, this pressure washer comes with a 34-inch extension wand. You can use it to access difficult-to-reach areas, and even clean the siding There is also a quick selection dial with which you can choose between dual detergent tanks. That’s useful when you want to store 2 separate cleaning agents and change between them with one click. If the pump is running, but you don’t press the trigger, there is a TSS system in place that automatically shuts it off. The Total Stop System saves energy and prolongs the water pump’s life. There are 5 quick connect nozzle tips for various applications, that can be stored aboard the pressure washer. Also, you get a 20-foot high-pressure hose with the unit. This Sun Joe pressure washer also comes with a garden hose adapter on the front. There is some light assembly required when you first get the unit. Luckily, a detailed instruction manual included with the pressure washer. You can immediately start the cleaning after assembling, as this product comes with everything you might need. Apart from being easy to move around (even carry), it has 2 wheels that can tackle any terrain. You also get a 35-foot power cord so that you can cover a lot of area in one go. Sun Joe brand is looking forward to maintaining a good customer relationship service. If you are missing a part, they will be happy to send it to you – but of course, it’s better to check the package as soon as it gets delivered. For this pressure washer, the overall warranty is 2 years. With this medium-duty pressure washer, you can easily wash the dirt, grime, mildew, tar, oil, moss, even rust. Furthermore, during the season, you can also get rid of pine cones needles. You can also clean your car, bicycle, RV, trailer, mower, grill, even stairs, and patios. When it comes to various surfaces, a medium-duty cleaner is perfect for wood maintenance, siding, shutters, patio furniture, and more. 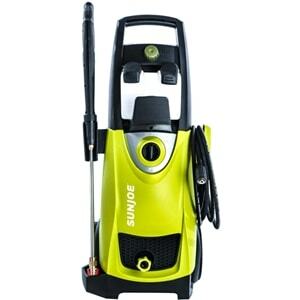 This pressure washer is really light and can be moved around with ease. Also, this unit comes with brass fittings, so the leaking possibility is reduced. The best pro feature about Sun Joe SPX3000 is its budget-friendly price. This is still considered as light to medium-duty residential cleaner and cannot withstand prolonged and continuous use. You cannot control the pressure output with this unit. All cleaning needs differ from person to person. For some, this Sun Joe will be a perfect solution, and for others, it will be lacking in power. We were quite content with the results, however, a more powerful pressure washer would have performed some cleaning tasks faster. If you are looking for a versatile unit that will help you keep the outside of your home clean, and you plan on using it occasionally, this is a perfect solution. When you consider that renting a power washer can amount to $100 per day, it’s evident that that money is better invested in getting your own pressure washer. We hope we have tackled all the questions in our Sun Joe SPX3000 review, but if we haven’t, you can always write them in the comments below.